Great games are happening all over in Manhattan Beach Little League as playoff competition continues. Here's a look at some recent games. 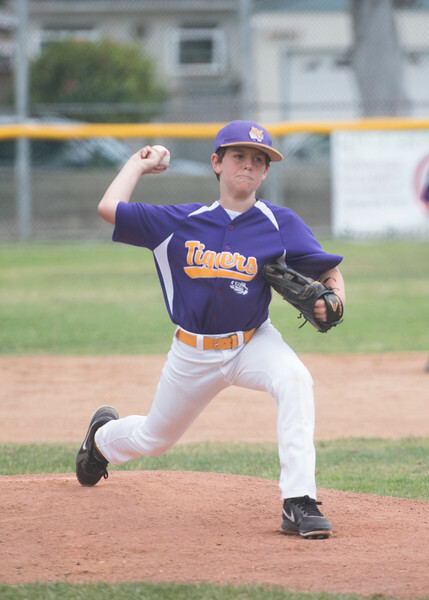 Pitching and defense were the story of the day on Saturday, May 16 as the Tigers beat the #1 seed Rams, 7-0. A Tigers pitcher helps the team shut out the No. 1 seed, Rams. Lou Guerrero, Derrick Lietzow, Ian Draves, and Noah Daniels combined to throw a six-inning shut out, giving up only one hit. Starting for the Rams was Jonah Storey who only gave up one walk over three innings with eight strike outs. However, he was matched by Lou Guerrero, Derrick Lietzow and the Tigers' defense who also did not give up a hit over three innings. Ian Draves took the mound in the top of the 4th and shut down the Rams' high-powered offense with 3 Ks and only allowing one hit. The Tigers offense exploded for seven runs in the 4th inning following a lead-off single by Noah Daniels. Hits by Christian Hunter, Ian Draves, Lou Guerrero, and Steve Lietzow added to the run total. In the 6th, Noah Daniels took over from Ian Draves to record the save for the Tigers. With the win, the Tigers advance to the winner's bracket final to face the Huskies. Congratulations to the Mudcats for their 5-1 win over the Muckdogs and advancing to the Championship Game on Tuesday, May 19 at 6 p.m. at Marine Avenue Park. The Mudcats were finally tested in the playoffs as they trailed the surprising No. 7 seed Muckdogs 0-1 after three innings. However, the #1 seed Mudcats got on the board starting in the 4th inning and built their lead to take what proved to be commanding as the Muckdogs bats were kept at bay with the 1-2 pitching combination of Chase Meidroth and Merrick Baldo. The Muckdogs fall to the Sunday loser bracket final and will face the red hot Bulls, winners of 7 of their last 8 games. In the best game of the playoffs, the Bulls battled a talented and balanced No. 2 seed Emeralds team. Ethan Chang started on the mound for the Bulls and gave way to staff ace Brian Regan. Matching them throughout was the tandem of Jared Karros and Colin Livingston. The back and forth contest had each team demonstrating resilience and heart as they entered the 7th inning tied at 5. After holding the Emeralds scoreless at the top of the innings, the Bulls' Michael Duffy led off with a deep double to left center, followed by a walk off double by Nate St. Germain for the win. In a game that brought out the best in both competition and sportsmanship, the Bulls advance to Sunday and face another elimination game vs the Muckdogs at 10 a.m. at Marine Avenue Park. Both top seeds were under fire this weekend in International Division playoff action. The second-seeded Grays were sent to the loser's bracket, while the top-seeded Barons needed an improbable last-inning comeback to remain undefeated. There are 6 teams left in the playoffs, with action continuing Wednesday night and resuming after Memorial Day weekend. A dominant performance by the Cubans' pitchers surprised and derailed the second-seeded Grays on Saturday. After losing just one game all year behind a potent offense, the Grays managed only one hit against Cubans pitchers Andrew Martens, Dylan Warner, and Ryan Kalan, who led their team in the 13-0 win. The game turned lopsided quickly as the Cubans exploded for 8 runs in the first two innings, their offense led game-long by Ryan Kalan, who hit a double and scored in the first, and tripled in his next two at-bats, driving in four runs while scoring three himself in the game. Eight different Cubans batters came around to score during the game, with Joshua Cochran, Roman Garcia, and Dylan Warner each scoring twice. Andrew Martens had 2 RBIs and Garcia had 3 RBIs. Christopher Layden went 3 for 3 with a double and two singles. The Cubans recorded 14 of the 18 outs against the Grays on strikeouts, highlighting the dominant pitching they put on display. The defense did its job, making no errors. Having beaten the No. 2 seed, the Cubans now await a May 27 matchup against the top-seeded Barons, who narrowly escaped with a win Saturday over the Eagles. The Eagles suffered a heartbreaking 6th-inning loss to the undefeated, first-seeded Barons when their five-run lead evaporated in a crazy last half of the final inning. The Barons took an early 2-0 lead, but the Eagles jumped out 5-2 in the third. The Barons swiped that momentum by quickly tying the game. Then it looked like the Eagles’ day again, as they added four more runs in the fourth by loading the bases against pitcher Ryan Vena, chasing Vena and scoring on consecutive singles by Patrick Rager, Robby Bennett, Kyle May, and Andrew Fiedler. The score turned to 12-7 as the Eagles added three more runs in the top of the 6th, with hits by Finn Warren, Connor Thue, and Luke Fratello adding to the challenger's margin. But the wheels came off for the Eagles in the bottom of the 6th as the Barons got one quick out but never suffered another. Two walks set the table, and the Barons capitalized with singles and aggressive baserunning by Garrett Davis and Cal Porter, making it 12-10. Tillman Cummings came up with two runners on and drilled a long single to center. Trying to stop the tying 12th run from scoring, the Eagles brought the ball home, but the throw was wild. Cummings continued running as the 12th run scored and the Eagles’ catcher fetched the ball. Cummings saw an opening, tore home and hit the plate before play could be officially stopped by the pitcher getting back to the rubber with the ball. An improbable three-run play on a single had flipped the result, the Barons remaining undefeated and the shellshocked Eagles going home wondering what might have been.